Our low mileage 1969 Nova is a 9,317-mile virgin car, and although it was repainted once in the past, most of it is pretty much as-produced at the factory. The base black vinyl interior is largely unmolested — and aside from a piece or two — exactly like it left the Willow Run, Michigan, assembly line in the third week of July, 1969. It’s an extremely late build date for the model year, and as a result, we’ve found a few 1970 pieces on the car. In addition, we didn’t super-detail the interior for this article. We just cleaned up the debris from the trucking company that hauled the car (another topic entirely). The truth is, we wanted to show it like it is. Check it out. We think you’ll find it interesting. 1 This is a standard trim door panel for 1969; 1969 to 1970 door panels are the same. Panels for 1968 models have different window crank locations, and different door lock knob locations. Custom interior door panels have a large band of white running horizontally across the door, along with a chrome mylar strip that stretches across the top. 2A & 2B Door lock knobs and window cranks are the same as virtually every GM passenger car in the late ’60s (aside from high-end models). The window crank handle began life almost clear, but as they age, they yellow, and eventually become gold. Door lock knobs on the other hand are susceptible to cleaners and vinyl conditioners. Some are good at removing the chrome. You can still buy the knobs from Chevrolet (at least at the time of this writing). 3 Here’s a look at the armrest and pad. This is what the original vinyl grain pattern looks like. Often, the pad cracks around the inside edges with use. 4 The stock driver’s side foot well looks like this. We’ve made no major attempt at cleaning, so please look past that. The plastic piece under the steering column is often damaged. Here’s a look at how it was installed (over the floor covering). You’ll note how poorly the floor covering fits over the dimmer switch too. It’s not torn and it has never been removed. It just fit this way. 5 This car is a radio delete, no A/C model. It has few options, and as a result, the instrument cluster is bare bones. If you look closely, you’ll see that the screws that hold it all together are dark gray in color, perhaps phosphate- or oxide-plated. 6A & 6B While the steering wheel itself isn’t cracked, the shroud shows a common problem shared with base Chevy steering wheels from 1969-’70. You can see where the cover (shroud) has split on either side of the horn button. Fortunately, reproductions are available today. It’s interesting to note that biggest wear on the steering wheel is in the area of the horn buttons. We suspect this was a sign of the times for the original owner. 7 Inside the glove box the pattern of gray phosphate plating of fasteners and parts continues (check out the catch). You’ll note this car doesn’t have a glove box lamp (open hole top left of the door opening). Note the pair of door bumpers on either end of the opening. Meanwhile, it’s pretty obvious the ashtray was used. Surprisingly, the cigarette lighter showed little if any use. Ashtray “receivers” can be restored or you can source reproductions. 8 The seat adjustment knob is a chrome-plated plastic affair (even on base cars such as this). They often break, but reproductions are readily available. Ditto with door sill plates. Note the original riveted “Body By Fisher” name plate. Some reproductions have the rivets. Some don’t. 9 The correct rubber floor mats for these cars are difficult to find. Reproductions are available, but often, they don’t fit well. Originals seem like they were “poured” over the floor pan. There are two different part numbers for the front floor covering – one for floor shift manual transmission cars and one for column shift cars. The only difference we can determine is the hole cut in the floor for the shifter. 10 Kick panels are molded plastic. Note the Phillips head screws for the vent are of the trim variety (with a raised washer) and they’re bright plated. Under the dash, the glove box door fasteners are again, gray in color. 11 Seating accommodations in a base Nova made a Road Runner look opulent. This is the base vinyl 731 code trim interior. It was the entry level arrangement regularly selected by frugal buyers or racers. 12 Seat back locks were government mandated. Here, they used a chrome release latch on either side of the seat. You can see that the underside of the seat was covered in a canvas like cloth. Note that the seat mechanics (hinges, latches, etc.) were simply painted gray. 13 Headrests were normally stowed down. In this photo, you can see the hardware used for the head rest release. It’s all chrome, with bright Phillips head fasteners. By the way, there’s considerable interchange with other Chevy and GM products here (ditto with the seat back locks). 14 In 1969, there was an absolute maze of seat belt hardware found in passenger cars of all sorts. 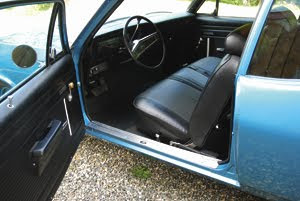 This bench seat Nova has a seating capacity of six. In the rear, there are lap belts for three passengers. 15 As a result, there are three lap belts in the front along with shoulder harness assemblies (mounted on the roof pillar) for outboard front seat passengers. The roof retainers are brushed silver with bright Phillips head fasteners. 16 Meanwhile, the large anchor bolts are gold cadmium plated. Bottom line cars such as this have black plastic buckle covers with a GM “Mark of Excellence” foil badge in the center. 17The outboard front seat belts were equipped with retractors enclosed in a black plastic sleeve. The sleeve also covered the anchor bolt. 18 GM used this stainless steel backed day-night mirror in a number of applications. In some cars (for example, Camaros of the same era), the trim piece covering the mirror had provisions to stow the ends of the sunvisors. As you can see, Chevy didn’t include them with the low-end Nova. 19 On the outboard side of the sunvisor, the trim piece was chrome plated and held in place with four bright Phillips screw fasteners. Like the mirror, these pieces saw use in other GM applications. 20 The factory package shelf was similar to those used in any number of vintage Chevys. It’s basically cardboard with a lightly (foam) padded edge against the seat. Trim screws for the back molding are bright plated. 21 The headliner in this car is non-perforated and up close, proves to be basket-weave material (there are several different headliner material types available in the reproduction market). Note the extremely basic dome lamp. It’s not even plated! By the way, only the driver side door has a switch to activate the dome lamp.